1Heat a pan over medium heat and add butter. Once the butter is sizzling, add the sage leaves and cook until crispy, about 1 minute per side. Remove the sage leaves and place them on a paper towel to crisp up. Pour the butter into a bowl and set aside. 2In a large bowl, combine cream cheese, Greek yogurt and white cheddar cheese. Using a hand or stand mixer beat until combined. Once smooth, add in the sage leaves, reserved butter and salt and pepper. Beat on low speed until combined, scraping down the sides and the bottom if needed. 3Transfer the cheese mixture to a clean cutting board and mold it into a big ball (or as close as you can get). Wrap the ball in plastic wrap and refrigerate for 30 minutes. 4After the cheese ball has refrigerated, roll it into a smoother ball. Add the dried cranberries to a plate or baking sheet and roll the ball through them, using your hands to press cranberries into all the cracks and crevices. 5Serve immediately or refrigerate until ready to use. 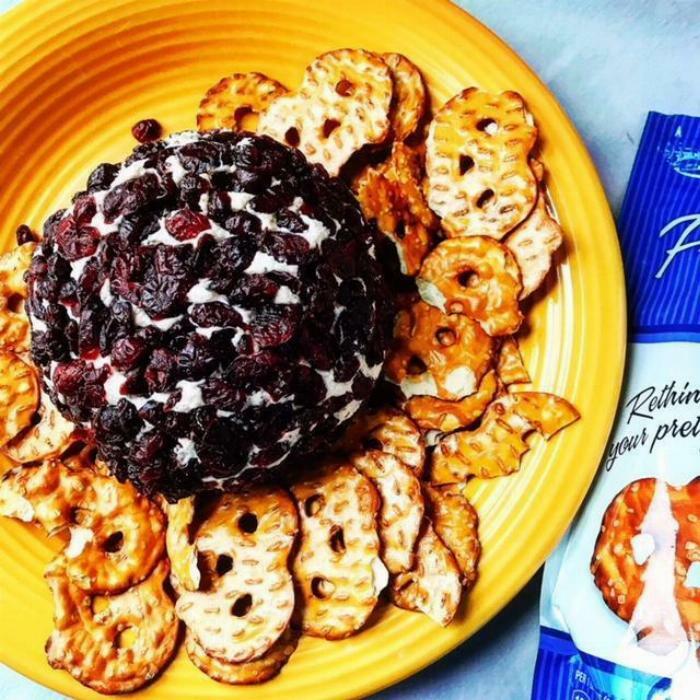 Serve with pita chips, pretzel crisps or crackers of your choice. Cheese ball can be made up to 2 days beforehand.